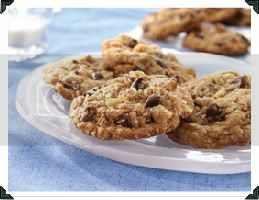 Oatmeal cookies with chocolate chips and toffee... yummm - need I say more? Sift together Baking Soda and Four in a separate bowl. Add Egg and Vanilla, mix until well combined. Add Oatmeal, mixing until dough forms. Stir in Toffee Chips and Chocolate Chunks/Chips. Form dough into two logs and wrap in plastic wrap. Unwrap - slice cookies approximately 1/2" thick and place on greased parchment paper (or silpat) lined pan.